WP Fusion integrates with WooCommerce to add customers your CRM when they make a purchase on your site, and tag them based on products purchased. You can also use WP Fusion to restrict access to products and product variations, as well as track coupon usage, and auto-apply coupons based on CRM tags. By default, when a customer checks out on your store, a new contact will be created in your CRM with their first name, last name, and email. You can enable additional fields for sync from the Contact Fields tab in the WP Fusion settings. WP Fusion gives you a variety of ways to tag your WooCommerce customers in your CRM. The simplest method is to tag based on the product purchased, but you can also apply tags to all customers as a global setting, or based on product categories. When WP Fusion is active, you’ll see a new tab on the WooCommerce product settings where you can specify tags to be applied when that product is purchased, refunded, or when an initial transaction fails. You may see additional fields for Subscriptions or Deposits if you are using those plugins. 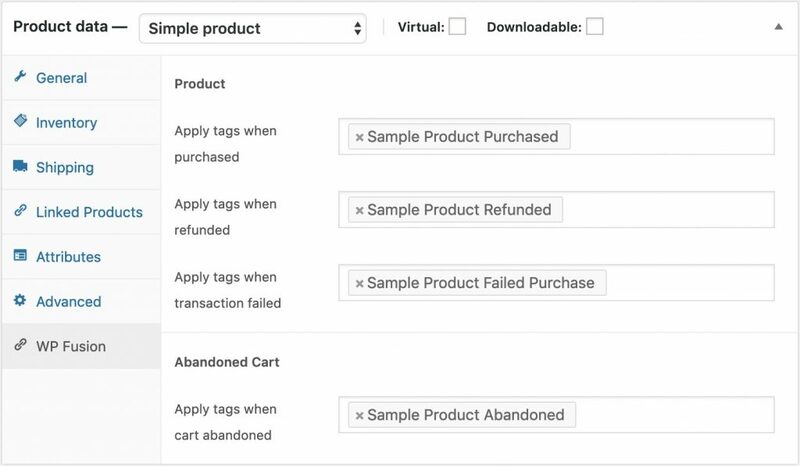 If the Abandoned Cart Addon is active you can also configure tags to be applied when the product is left in an abandoned cart. If you’re using variable products, you can also specify tags to be applied at purchase per-variation. These are visible when editing the variation, alongside the price and other details. WP Fusion also gives you the option to only show specific variations to users based on their tags. This can be used to offer special products or pricing to existing members. You can also specify tags to be applied at the category level. To do this click Edit on any product category, and you’ll see a setting where you can specify tags to be applied. If you would prefer not to set up category tags manually, WP Fusion can also generate tags based on the product category name at checkout (with supported CRMs). To enable this, go to Settings » WP Fusion » Integrations, and check the box for Product Category Tagging. 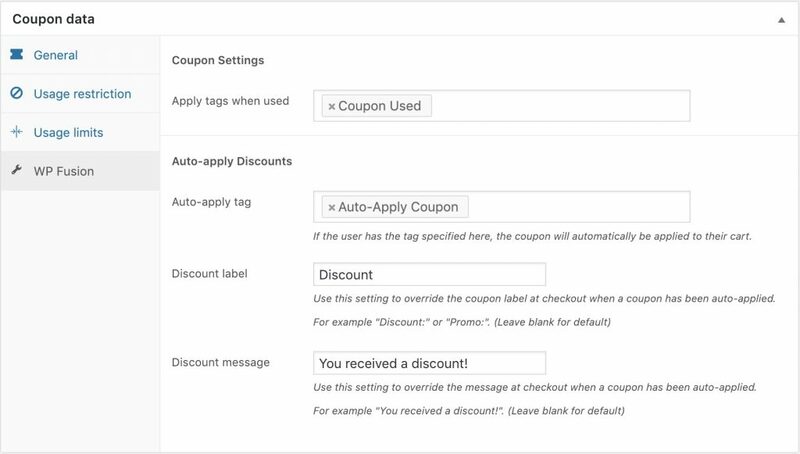 While editing any coupon, you can specify tags to be applied to the customer if the coupon is used. 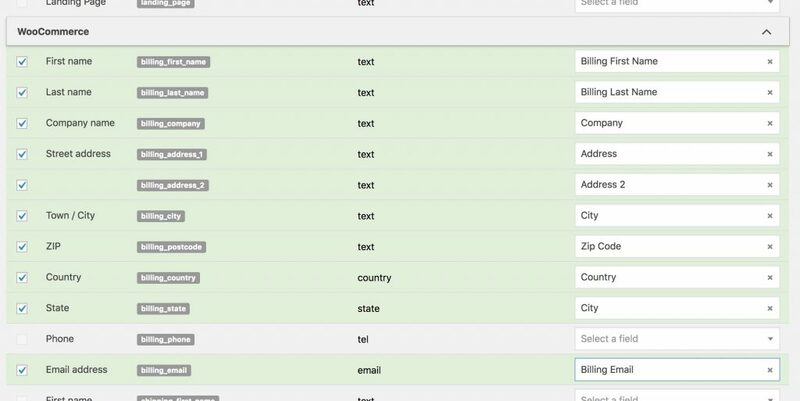 You can also automatically grant coupons to customers based on their tags in your CRM. If the user has any one of the specified tags, the discount will be applied when they add a product to their cart. This feature also works with our auto-login links. 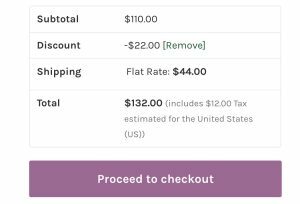 You can optionally override the coupon labels shown on the cart and at checkout. The Discount label is displayed in the order summary. Custom discount label in the order summary. By default this will be the coupon code of the applied coupon, but here we’ve overridden it to say “Discount”. You could set this to say something like “Member Discount” or “Loyalty Program”. The Discount message is shown at the top of the cart or checkout when the coupon is applied. 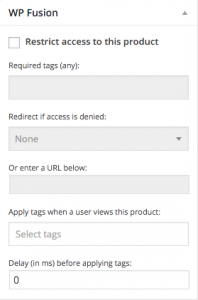 You have the option to restrict access to a product unless a user has a certain tag applied to their account. This is a great way to offer up-sell products or add-ons for your existing users. For more information on restricting content, see the documentation on meta box setup. If you already have an existing WooCommerce store, you can use WP Fusion to sync all historical orders to your CRM. First configure your products with any tags you’d like to be applied when purchased. Then navigate to Settings » WP Fusion » Advanced and scroll down to the Batch Operations section. Select “WooCommerce orders” from the list of options, and click Create Background Task. WP Fusion will go through all of your orders, adding / updating contacts as necessary, and tagging them based on the products purchased. A status bar will appear at the top of the page indicating the progress.